This is the privacy and fair processing notice of Felicia Canepa trading as Orange Therapies. In this document, “we”, “our” or “us” refer Orange Therapies. References to “our Website” or “the Website” are to www.orangetherapies.co.uk , www.orangetherapies.com and other sub domains of the aforementioned websites. We are a “data controller”. This means that we are responsible for deciding how we hold and use personal information about you. We are required under data protection legislation to notify you of the information contained in this privacy notice. We may update this notice from time to time. It is important that you read this notice, together with any other privacy notice we may provide on specific occasions when we are collecting or processing personal information about you, so that you are aware of how and why we are using such information. This notice will also bind any successor to our business which processes your personal data in the future. This website may include links to third-party websites, plug-ins and applications. Clicking on those links or enabling those connections may allow third-parties to collect or share data about you. We do not control these third-party websites and are not responsible for their privacy statements. If you leave our website via such a link, we encourage you to read the privacy notice of any website you visit. We collect data about all users of and visitors to these areas regardless of age, and we anticipate that some of those users and visitors will be children. Such child users and visitors will inevitably visit other parts of the site and will be subject to whatever on-site marketing they find, wherever they visit. Personal data, or personal information, means any information about you from which you can be identified. It does not include data where your identity has been removed (anonymous data). Identity data such as your name, title, and gender. Personal contact data such as postal and email address(es), landline and/or mobile telephone numbers, social or business media accounts. Information about your employment or role and occupation. Technical Data includes internet protocol (IP) address, your login data, browser type and version, time zone setting and location, browser plug-in types and versions, operating system and platform and other technology on the devices you use to access our website(s). If we are providing you with products or services personally (rather than to a company which is your employer) financial information about your dealings involving us which may include your bank account details and any details of any transfers of funds to us. (Transaction Data). If you request us to provide you with products or services personally (or you are a director of a company and ask us to provide that company with products or services), we may perform credit reference checks on you via credit references or similar agencies. Their results will contain personal information on you that we may use to determine whether to act for you or for an entity in which you have an interest and whether to request payments on account. (Credit Reference Information). Marketing and Communications data including your preferences for receiving newsletters, and event invitations from us and your communication preferences (how you will be contacted). We will also collect Special Categories of Personal Data about you including information about your health. 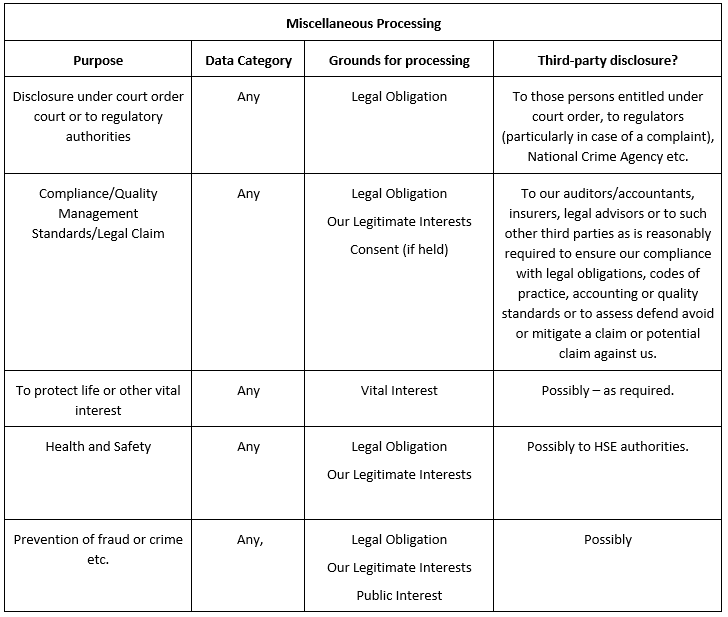 We collect personal information about you in the course of providing our services to you (or to an entity of which you are an employee or officer) by asking for or otherwise obtaining information we may reasonably need to know to enable us to provide those services lawfully and to the appropriate standard. We may collect this information by your completion of questions on our website, face to face, over the telephone, electronically via email or writing. We may collect additional personal information by any of the above methods in the course of providing the requested services throughout the period of our relationship. In relation to Marketing and Communications data we may also collect this data where you have made enquiries of us or expressed an interest in any of our products, services, events or marketing materials (whether in person or via telephone, email, website or social media). Where we need to protect someone’s life. Where you have ordered products or services from us, we will need certain of the categories of information listed above (see the paragraph above titled ‘The kind of information we hold about you’) to allow us to perform our contract with you to the appropriate standard. In some cases (for example in relation to use of Marketing and Communications data) we may use your personal information to pursue legitimate interests of our own provided your interests and fundamental rights do not override those interests or we may rely on your specific consent to process. You can stop us from using your personal information for marketing purpose by requesting this at any time. We may also need to process your personal information if we have a legal obligation to do so or are ordered to hand over data by a court or other relevant authority. The situations in which we will process your personal information are listed below. We have indicated the purpose or purposes for which we are processing or will process your personal information, as well as indicating which categories of data are involved and whether any third parties may receive the same. 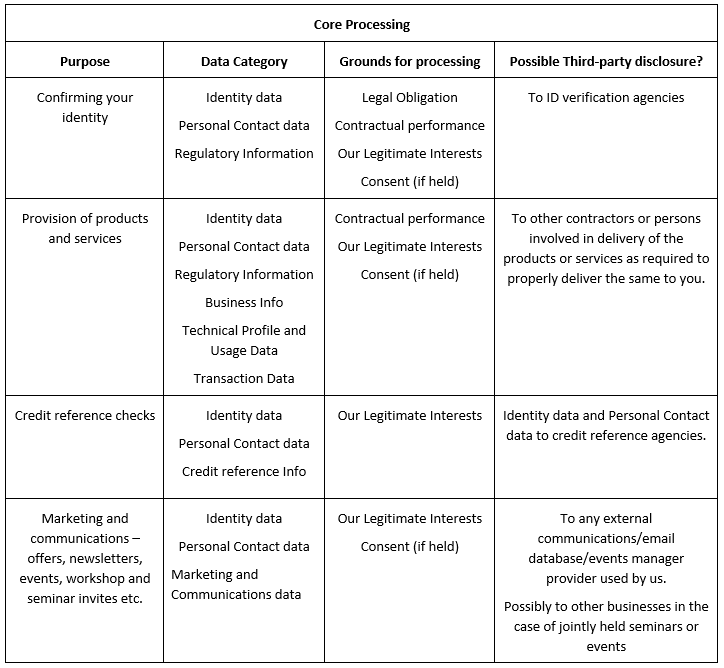 As noted above some of the above grounds for processing may overlap and there may be several grounds which justify our use of your personal information. We do not envisage that any decisions will be taken about you using automated means, however we will notify you in writing if this position changes. You will not be subject to decisions that will have a significant impact on you based solely on automated decision-making, unless we have a lawful basis for doing so and we have notified you. Legitimate Interest means our interest in conducting and managing our operations to enable us to give you the best service/product and the best and most secure experience. We make sure we consider and balance any potential impact on you (both positive and negative) and your rights before we process your personal data for our legitimate interests. We do not use your personal data for activities where our interests are overridden by the impact on you (unless we have your consent or are otherwise required or permitted to by law). You can obtain further information about how we assess our legitimate interests against any potential impact on you in respect of specific activities by contacting us. Contractual Performance means processing your data where it is necessary for the performance of a contract to which you are a party or to take steps at your request before entering into such a contract. Data sharing – We may have to share your data with third parties, including third-party service providers. We require third parties to respect the security of your data and to treat it in accordance with the law. “Third parties” includes third-party service providers (including contractors and designated agents) and other entities which provide goods or services to us. The following activities may be carried out by third-party service providers: credit reference checks, provision of online communications and cloud-based database solutions. How secure is my information with third-party service providers and other entities? All our third-party service providers are required to take appropriate security measures to protect your personal information in line with our policies. We do not allow our third-party service providers to use your personal data for their own purposes. We only permit them to process your personal data for specified purposes and in accordance with our instructions. Third parties processing your personal information on our instructions will have to agree to treat the information confidentially and to keep it secure. We may also share your personal information with other third parties, for example in the context of our possible merger, sale or restructuring or with a regulator or to otherwise comply with the law. Some cookies may last for a defined period, such as one day or until you close your browser. Others last indefinitely. Personal identifiers from your browsing activity. We will only transfer your personal information outside the EU with your informed consent, at your specific request or where such transfer is reasonably required for our legitimate business purposes and where the transmittee either resides in a territory with an EU adequacy declaration or has contractually agreed to comply with data protection provisions affording your personal data protections equivalent to the protections given under EU law. At present the only international transfers of your data anticipated are to Mailchimp which is a global provider of email communications solutions and cloud-based contact databases and which has entered into contractual data protection provisions with us complying with the EU standard clauses in this area. Unless you have requested its earlier destruction, we will retain your Marketing and Communications data for marketing and communications purposes for no longer than 3 years after its acquisition save where you have during that period updated the same, or confirmed that you wish to remain on our Marketing and Communications database or we have provided products or services to you or your employer (in which case the 3 year Marketing and Communications data period runs from the date of the last such update, confirmation or service/product provision). However personal treatment records shall be kept for at least 7 years following the last occasion on which treatment was given. In the case of treatment to minors, it is advisable that records should be kept or at least 7 years after they reach the age of majority (18). Request erasure of your personal information. This enables you to ask us to delete or remove personal information where there is no good reason for us continuing to process it. You also have the right to ask us to delete or remove your personal information where you have exercised your right to object to processing (see below), unless we have a legal obligation to retain this data. If you want to review, verify, correct or request erasure of your personal information, object to the processing of your personal data, or request that we transfer a copy of your personal information to another party, please contact us via email at felicia@orangetherapies.co.uk. In the limited circumstances where you may have provided your consent to the collection, processing and transfer of your personal information for a specific purpose, you have the right to withdraw your consent for that specific processing at any time. To withdraw your consent, please contact via email at felicia@orangetherapies.co.uk. Once we have received notification that you have withdrawn your consent, we will no longer process your information for the purpose or purposes you originally agreed to, unless we have another legitimate basis for doing so in law. We reserve the right to update this privacy notice at any time, and we will advise you when we make any substantial updates. We may also notify you in other ways from time to time about the processing of your personal information.